QUAKETIPS: Did the movie San Andreas suggest the “Triangle of Life” myth? Just kind of. 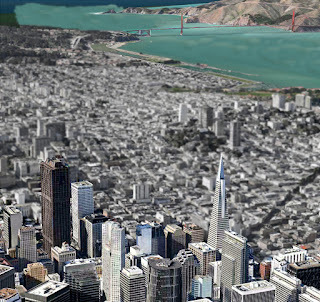 Poor San Francisco. My favorite city just keeps getting destroyed, and I know all about this because I go to the movies and see it for myself. Let’s see, just in the last few years, we’ve been run over by Godzilla and friends, we’ve been trashed by a gene therapy experiment gone wrong followed by a bunch of angry intelligent apes, we’ve had the Golden Gate Bridge uprooted from Marin and attached to Alcatraz by a magnetic mutant, we’ve seen the future in which a starship crashes into the Financial District, and now in what seems positively normal in comparison, we get devastated by a massive earthquake while Dwayne “The Rock” Johnson runs around with film crews closing off access to residential streets and creating inconveniences. When will it stop?? 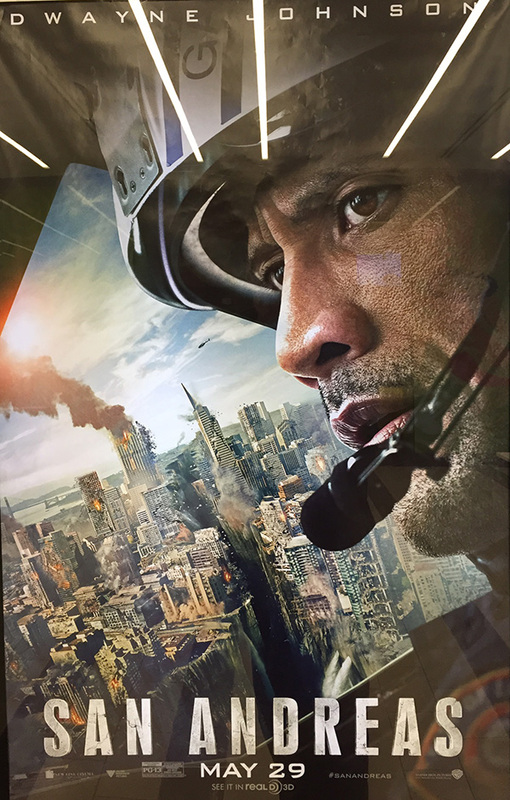 That last example, of course, is the movie San Andreas, which came out this week. 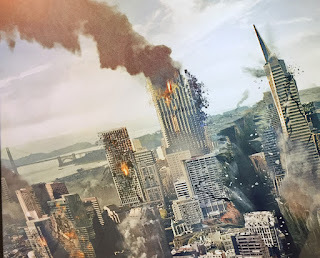 I went to see it today, not only because it’s rare to witness San Francisco being destroyed by an earthquake while in San Francisco without having to worry about being hit by flying objects, but also because they filmed on location in my part of town so it’s fun to see the result. 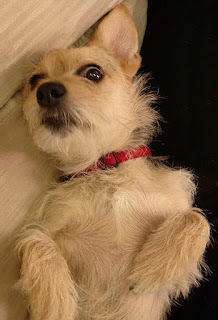 In fact, I really wanted to see if my dog Milo (who is very dramatic, see photo) managed to get into the movie. They were filming around AT&T Park, home of the San Francisco Giants (and let’s just say that a 4th winning World Series in 6 years at AT&T Park seems unlikely in the plot of this movie). Milo was out on a walk and ended up near the filming, where a huge crowd of extras was assembled for the movie. At one point, the crowd was told to panic and start running, toward Milo in fact, and he started barking like crazy. So I’ve been wondering if scenes of devastation and panic near AT&T Park would include a familiar-sounding barking. I listened but there was a lot of noise! I suspect that if a bunch of buildings collapsed and a bunch of people screamed and a dog barked, it would sound about like what I heard. On the other hand, the credits at the end of the movie listed “Rescue dog: Snowy” so perhaps it was Snowy barking; I’ll never really know. I actually enjoyed the movie quite a bit. I was expecting to see exciting earthquakes and cool effects with a lame plot, but actually, I thought the story and acting were all good, despite what some of the movie reviewers have been writing. Incorporating Sia singing a very amped-up version of California Dreamin’ at the end (not a spoiler, don’t worry) was a nice touch. In 3D, the earthquake effects were terrific and the devastation was pretty impressive. 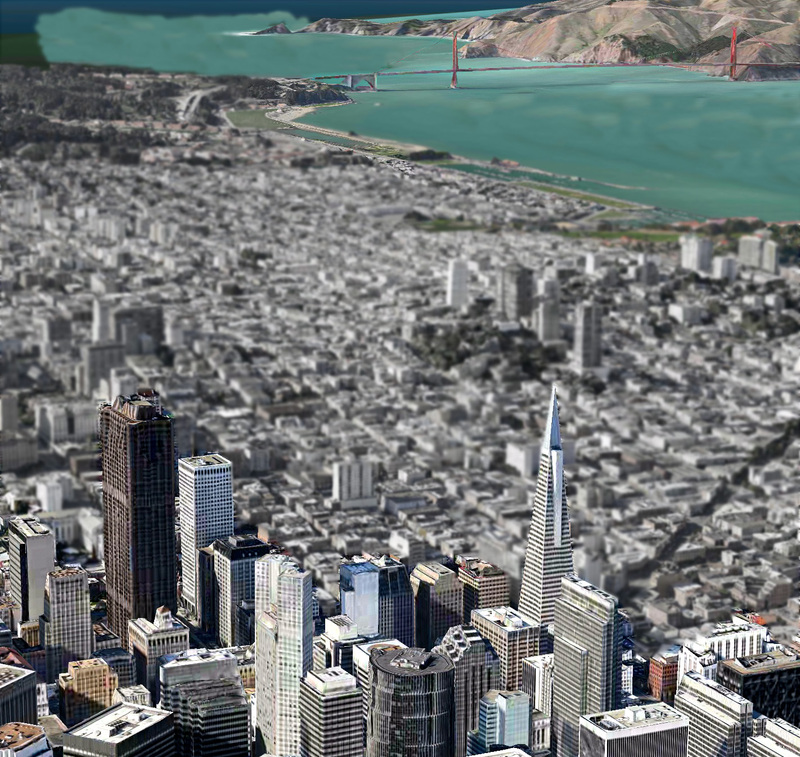 For some reason though, the first view of the San Francisco skyline was compressed vertically so the buildings were too short; really ironic for this movie! The movie poster that I saw as I entered the theater showed downtown San Francisco on the wrong side of the Golden Gate Bridge, which would have been impressive destruction indeed, but they didn’t actually do that in the movie. Still, I was mostly curious to see how accurately they handled issues of earthquake response in ways that might influence the public’s behavior in a real event, for better or for worse. Here, I give it an A-. Paul Giamatti’s character, the Caltech seismology expert (who had one of the movie’s best lines, about Caltech; you’ll just have to go see for yourself) did the real-world public a great favor when the quake first hit LA. Not only did he and his staff dive under a desk (correct move), but when a reporter who was in the room instinctively went to a doorway (incorrect move despite what you learned as a kid), he literally pulled her out and said something like “no, get under here; drop, cover, and hold on!” That was quite an advertisement for correct response to an earthquake. 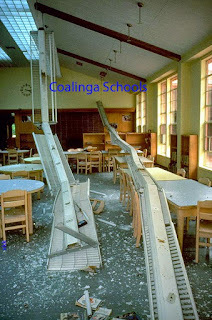 He also did not attempt to run out of the building, good for him and the script writers. The problem? Two actually. First, the advice is a mutation of what you are supposed to do if you are INSIDE and if you have NOTHING TO GET UNDER. In that case, you are supposed to crouch down covering your head near an interior wall, in case a ceiling beam comes down (which is pretty rare). We were even taught this in a San Francisco Fire Dept. Neighborhood Emergency Response Team (NERT) class, with the trainer even using the term “Triangle of Life” to refer to the partially sheltered zone near where the ground and the wall meet. However, if you are outside, you want to avoid being near walls because of the glass and bricks and anything else on those walls that might fall straight down. This is why you are not supposed to run out of a building during a quake; because you want to avoid the very spot that Ray Gaines told people to assemble. In defense of Ray and the script writers, the scene in the movie showing an earthquake larger than any ever recorded was not your typical earthquake scenario. With buildings falling over and rubble flying through the air, since this particular structure didn’t have windows or bricks, perhaps being next to it would have been safer than being in the middle of the street with glass shards flying around, but it’s not considered good advice for most buildings in most quakes! My bigger problem is that, as frequent readers of this blog have seen me hammer in repeatedly, “Triangle of Life” is also a name that has achieved notoriety as part of a widely discredited viral e-mail that has been propagated for years by well-meaning but clueless people, in which a self-described emergency response expert claims that you should not seek shelter under a sturdy object during a quake, but instead should get next to it. He claims erroneously that the desk that you'd be under would be crushed along with you, and that getting next to it would protect you in a safe triangle next to the desk, which is completely contradicted by the facts. Please re-familiarize yourself with the issues by reading my earlier article, but the bottom line is that this e-mail is based on misconceptions and outright false statements, and contains advice that could put people directly in harm's way. Unfortunately, the two versions of the “Triangle of Life” have some similarities and are easily confused. I worry that viewers of the movie will come away with the idea that “Triangle of Life” and “get next to something” are good advice, and then when they see the spam e-mail of the same name, they will assume erroneously that the advice to NOT get under a sturdy object is good. Had Ray not uttered that problematic phrase, the real-world public would have been better served. Fortunately, Paul Giamatti’s scientist indoors told people to get under something; neither he nor anyone else in the movie suggested that people should get next to an object instead of getting under something sturdy. And, Dwayne Johnson recorded this public service announcement for FEMA in which he recommends the Drop, Cover, Hold On approach; good for him! I think it is also important to keep in mind that the advice you hear from real-world earthquake preparation/response experts is about real-world quakes. There’s always a hypothetical scenario that can doom good advice to failure, like the advice to lock your front door isn’t really helpful if there’s someone on the outside with a bazooka, and the advice to get under something in a skyscraper during a quake is kind of moot if the whole skyscraper is falling over due to all-powerful script writers. Having push latches on your cabinets and bracing the bookcases to the wall are precautions against the magnitude 6.0-8.5 range of earthquakes (the vast majority), and probably won’t help all that much in a 9.5 Armageddon! I hope that this movie won’t make people throw up their hands in helplessness and stop taking reasonable precautions against the earthquakes that are expected in their region. Much has been written already about the various liberties taken with earthquake science, such as having a tsunami in the San Francisco Bay caused by a strike-slip fault, or the massive size of the quakes (magnitude 9.1 and 9.6) that seismologists say are simply too large for a fault like the San Andreas to generate. However, because of the various high-profile earthquakes in the last few years, including three of the largest eight quakes ever recorded all occurring within the last 11 years (2004 Indonesia at magnitude 9.1, 2010 Chile at 8.8, and 2011 Japan at 9.0), it’s worth pointing out that these massive quakes occur in a different kind of fault system, known as a subduction zone. In these regions, one tectonic plate is diving under another, leading to massive rips in the earth’s crust and displacing vast amounts of water, leading to tsunamis. The San Andreas fault, like the other faults in the southern ~85% of California, is a strike-slip fault, in which one tectonic plate slides sideways against another plate, and the theoretical maximum size earthquake that occurs in these systems is about 8 (which is one tenth as large as a 9 because this is a log scale). The great San Francisco earthquake of 1906 was about 7.8, although most of the damage was caused by the fire. The recent Nepal quake was also 7.8, but most of the damage was due to poor building construction. I think it’s interesting that the largest quake ever recorded was a 9.5, and the movie gives us a 9.6; so they actually kept it within a realistic monster quake size, but they did it in the wrong place! At any rate, after the movie, I emerged from the Metreon theater to see downtown San Francisco on a beautiful sunny Sunday afternoon, completely intact, so I guess we are ok regardless of what I had just watched. 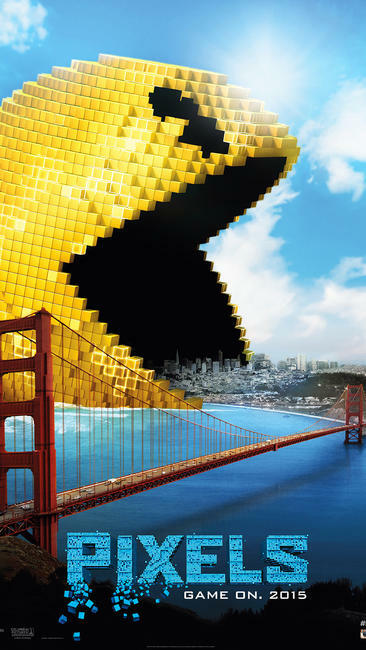 However, according to the movie poster that I saw as I exited the theater, San Francisco is going to be eaten this summer by a giant Pac-Man. I am not sure how to take adequate home preparations for invasions of giant Pac-Men, but I'm sure there's a good blog about that topic out there somewhere. 6/5/15 update: An article about the movie being widely disseminated over the AP erroneously says that "If you're outdoors when the ground moves, experts recommend bracing against a wall." In fact, the USGS and other emergency organizations emphatically state on their Earthquake Country Alliance website that crouching near a wall is not recommended if you are outside. I half elbowed my girl friend when the Rock uttered that line and whispered "I can't believe he just said that, tell you later why". I still get the Doug Copp email forwarded to me from time to time. As someone who works as a building engineer I cringe when I read Copp's Walter Mitty-esque ramblings. Any comments regarding the recent New Yorker article about the Cascadia fault line (which is a subduction fault and heads just offshore in NCA)? I just wanted to post a simple remark to say thanks to you for these lovely steps you are placing at this website. believe that we readers are very lucky to exist in a useful network with so many outstanding individuals with helpful things. I feel extremely fortunate to have discovered your website and look forward to many more pleasurable minutes reading here.